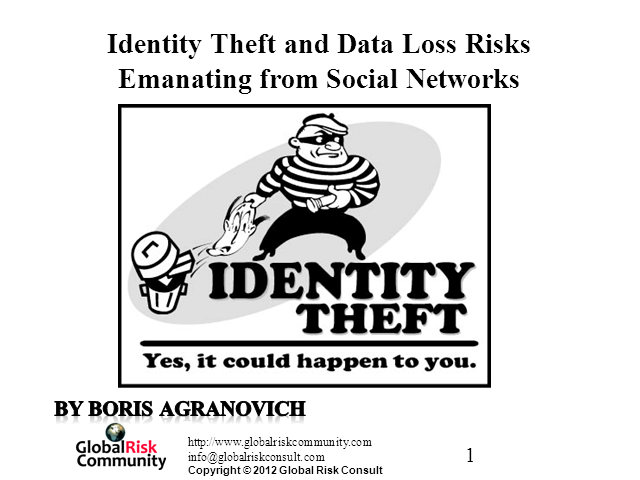 I would like to concentrate on types of identity theft (both individual and corporate) and major risks emanating from social networks. I will look at some of these risks and identify possible solutions to help protect you, your personal information and your company data. Boris Agranovich: Entrepreneurial business leader with 25+ years of global experience in Financial Services, IT and Consulting . Worked in West & East Europe, Middle East, Asia Pacific. Advised executive teams on effective risk management strategies.These range from regulatory requirements such as Basel II to strategic risk propositions such as defining and setting risk appetite, embedding risk management through the organisation. Founder of the world's premier community for Risk Managers. We help people in the risk area to be connected and the main customers are marketing managers who want to create a greater visibility for their products and services among their prospects with much better results even if they are small and don’t have large media and PR budgets. What sank the Titanic and is sinking some of our great companies? What will separate future winners from losers? 50% of the Fortune 500 companies in the year 2000 do not longer exist because they were not able to measure and predict their strategy execution risk and link their decisions to the results of their decisions. By the end of the webinar you will be in a better position to identify the risk to your strategy execution and understand why identifying and measuring your strategy execution risk must be an important component of your operational risk. The webinar is based on the SIMMETHOD risk and performance methodology and C-suite risk alerts, a top 10 innovation product from the Department of Trade in NSW Australia with top 1% views in LinkedIn’s Slideshare and frequently consulted by over 300 global Universities. In spite of Billions of dollars spent on Enterprise Risk Management and analytics, why do companies continue to fail or miss their targets? Can industrial era metrics mislead you into the incorrect decisions? According to IBM’s CFO Insights, 53% of CFOs think that they are not effective at measuring and managing performance and according to Deloitte, one of the top CFO concerns is predicting execution missteps. According to John Chambers, Cisco’s Chairman, 70% of the S&P 500 will attempt digital transformations during the next years but only 30% will succeed? Why? Although the C-suite is aware that digital transformations entail new processes, management procedures, information systems and customer relationships, we continue to use industrial era metrics that were designed for a business environment that does not longer exist. And… in digital transformations, the way you measure will determine your results. Additionally, the webinar will assist you to identify C-level metrics linked to the Best In Class and develop a bridge between you and your C-suite via holistic and industry agnostic actionable indicators. Join our guest, Dr. Ted Marra as he introduces his new strategic leadership course in Global Risk Academy. How does a truly strategic organization think? What is strategic thinking versus strategic planning? What are the vital few factors that will determine your organisation’s long-term success or failure and are they on your radar screen? People with 10 years management experience minimum up to and including C-Level in all disciplines responsible for strategic decisions or large scale operational issues - so they have large budget and many people reporting to them. Managers and senior management from all areas of the organisation having responsibility for planning and achievement of key business objectives. - What factors were critical to your success? What factors were the basis for your success? - What held you back – prevented you from being even more successful? Understand what are the most critical factors that will better ensure your organisation is a “winner” in the future (e.g., next 3-5 years). Find out which ones you may be missing and what to do about it before it’s too late and you become just an “average or good” organisation when, with a little effort and the right strategic thinking and creativity, you could take the organisation to the next level of performance and move toward “greatness”. How to build exceptional stakeholder relationships and why doing this is critical in especially in turbulent times. Learn How to Manage Risk for Protection - Allocate Risk to Improve Performance for capital market investors. Join our guest, William Goodwyn Ferrell, a Wall Street veteran and the founder of Ferrell Capital Management as he introduces his new course. 1. Why traditional notions of portfolio diversification are no longer effective tools. By replacing Asset Allocation with Risk Allocation you will achieve much more effective means for managing your investment portfolio. 2. We're going to lay out a system that will teach you how to manage risk for protection and allocate risk to improve performance. 3. We will introduce a new online course with a special offer for attendees only. In this short video, William G. Ferrell will show in a very illustrious way what his upcoming course will be all about. If you are a risk manager or a professional investor, your main goal is to increase returns in good times and protect your assets during the bad times. Use the attachment tab inside the webinar viewer. This course will teach you that traditional notions of portfolio diversification are no longer effective tools. By replacing Asset Allocation with Risk Allocation you will achieve much more effective means for managing your investment portfolio. This workshop is designed for busy risk professionals who are interested in studying both theoretical and practical application of ORM but don’t have time to attend in-person classes. 1. 3 things most organizations are focusing on right now. 2. What are the major steps to take control of operational risks. 3. How to use Collaborative Risk Management tools to conduct your ORM operations and why traditional risk management practices involving risk registers and Excel are not effective anymore. 1. Existing students will be able to understand more on how to work with the RISKID tool and get an opportunity to ask questions about the subject matter. 2. People who are planning to join the course will get some explanation in what is the course about, how the e-learning system works. Join me and our guest, Calvin Lee, Operations Director at RISKID, for a lively discussion as we aim to dispel confusion surrounding many of the elements of the Operational Risk framework. Operational risk is perhaps the most significant risk organizations face. Virtually every major loss that has taken place during the past 30 years, from Enron, Worldcom and Baring's Bank to the unauthorized trading incident at Société Générale and the subprime credit crisis, has been driven by operational failures. Many financial institutions have spent millions of dollars trying to develop a robust framework for measuring and managing operational risk. Yet, in spite of this huge investment, for many firms developing a viable operational risk management (ORM) program remains an elusive goal. This webinar is designed for both current students of the “Mastering Operational Risk” - http://www.globalriskacademy.com/p/orm online course and for other busy risk professionals who are interested in studying both theoretical and practical application of ORM but don’t have time to attend in-person classes. Chasing and fixing cyber threats can be depressing, rather like the old 'wack-a-mole' game. No matter how quick you are in knocking down the threat, or mole, new ones appear. We will present a strategy to break the cycle. You will still need to fight the cyber threats but you will have a way to become proactive and not be easy prey for the cyber predators. Interested? Come to the seminar and learn how. Worried about your cyber exposure? Not sure if you are as secure as possible? Are you afraid you are the ‘low hanging fruit’ that hackers feast on? If questions like these concern you we recommend you take this webinar. By attending ‘Managing Cyber Exposure’ you will gain a deeper understanding of cyber exposures, how they can harm your organization, and a framework you can use to address them. The framework will allow you to evolve and adapt your cyber exposure defenses as the cyber eco-system you inhabit changes. Early in 2012, an independent study confirmed that managing access risks were "very" or "extremely" important to senior leadership in their organizations. Yet many found it challenging to establish and maintain a program for managing access risk. The implications of giving unrestricted access to applications, systems and information to employees and other stakeholders as well as security breaches can impact a company's reputation and bottom line. The accelerated adoption of mobile devices in enterprises introduces new risks and complexities that need to be factored in to an effective and efficient way to manage access control and minimize risk. During this webinar you'll learn some of the challenges that companies are overcoming by implementing enterprise wide access risk control programs best practices. Some insights on why existing access control "solutions" aren't working will be explored. You’ll also see how implementation of best practices and automation of access controls program, will more effectively secure your enterprise and reduce risk exposure . You will also see how to monitor and secure your enterprise from unauthorized access while increasing productivity using SAP Access Control and the SAP Access Approver mobile app. 2. Illustrate the opportunity to benchmark both internally and externally (across sectors). This Webinar aims to assist risk management practitioners and consultants with their understanding of the process that is followed as well as the benefits of using the cloud-based version of ISO 31000Rx. This is a free Webinar that shares a Case Study of an actual risk management intervention using risk diagnostic tools (a New Zealand water utility); the presenter will share the benefits of this approach to facilitating risk management implementation. This Webinar is the second in a series to be presented by Dr. Dean Myburgh, a New Zealand-based Risk Management Consultant; it outlines the ‘how’ of the process followed in using a diagnostic consulting approach in a water utility company; this Case Study will demonstrate the importance of not only engaging at a senior governance level, but also following through with implementation at all levels in the organisation. ➢what can be done to improve the engagement of all levels of the organisation in the risk management implementation process? a free Webinar about an organisation development- and diagnostic risk approach to implementing ISO 31000 in organisations. using cloud-based technology; organisations can now engage in thinking about risk management and arrive at a risk index score based on best practice risk management (the International Risk Management Standard ISO 31000:2009). The approach facilitates incorporation of risk thinking and risk awareness into everyday work routines at both the planning and reviewing level. Boris Agranovich, Founder, GlobalRisk Community. The new world of B2B marketing is mixed with chaos, peril, constant change and unprecedented opportunity. In this webinar I will be sharing my ideas about future developments in the B2B online communities space. I will also provide some insights on building a community ecosystem and driving engagement based on my experience. Social media as a powerful communications platform: managing the risk and opportunities in your business and discussing the need for strategies and policies in dealing with social media issues.